In 1945, airlines were feeding passengers complete frozen meals, but it wouldn’t be until several years later that frozen meals would appear in stores with the debut of Swanson’s “TV dinners.” Interestingly, in the early 1950s, frozen meals arrived on the scene before many households had freezers to store them, which meant that the dinners had to be purchased and eaten the same day. It used to be enough for packaged food makers to box up or jar up established flavors and experiences under the rubric of convenience. This is how the convenience industry began in the 1940s and 1950s. This mindset is perhaps best captured in the 1950 quote by L. Chapman in Good Housekeeping: “…plan ahead, keep menus simple, and use lots of canned, packaged, and frozen foods.” During this time, convenience foods were being pushed and becoming popularized to such an extent that E.W. Williams said that “fresh produce for retail consumption is a thing of the past” in a 1954 article appearing in Quick Frozen Foods. In the early days, the most successful promoters of convenience foods pitched them not so much as solutions but as helpers. They were there to help the busy cook serve meals that would not require too much attention, effort or skill to prepare on a regular basis. No one, least of all consumers, really expected or wanted them to replace “real” cooking. Still, there was no denying that the simplest of convenience foods, those that sought only to stand in for basic components, could be immensely useful in the day-to-day preparation of the household’s standard repertoire of dishes. Convenience foods have undoubtedly transformed the way entire generations of American consumers have cooked and savored food. Even today, the role of convenience foods in the kitchens and diets of Americans owes a great deal to some 60-odd years of food history and innovation. During this time, we have seen a long-term shift away from a culture that valued conformity and rationality to one that prioritizes individuality and emotional resonance. 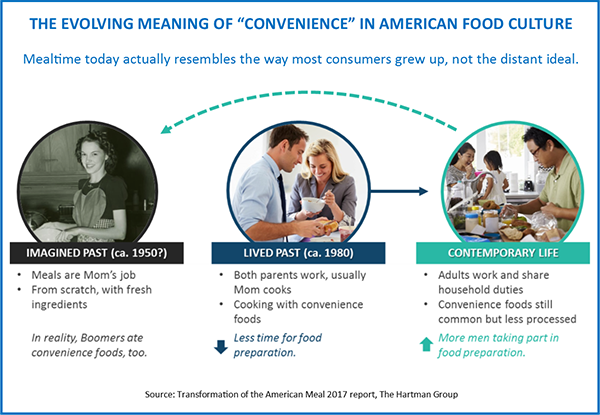 Throughout the colorful history of convenience when it comes to food, there has been a tension between convenience as “solution” and convenience as “helper.” Our Transformation of the American Meal 2017 report finds that consumers reference the past with their mealtime aspirations, but their lived pasts are typically more complicated. For most, cooking and eating in their childhood homes resembled the way they cook and eat now more than the imagined ideal. Most had mothers who worked and relied on convenience foods to get meals on the table. Our mealtime ideal (if it ever existed) is at least two generations ago and ignores the fact that 1950s housewives were the original adopters of today’s convenience foods, like TV dinners and canned foods. Products that assist, rather than replace, home cooking. These are especially what consumers are looking for on dinner occasions where they actually want to make a fresh, home-cooked meal. Making the world of flavors experienced outside the home more accessible at home. The family cook is less and less satisfied with only quick and easy solutions for meatloaf or macaroni and cheese. Instead, households are now looking for choices that compete more directly with the increasingly global range of flavorful offerings enjoyed at the plethora of sit-down restaurants (casual and fine dining). We asked consumers if and how convenience influences where they shop, what they buy, how they cook and so on. Here’s a sampling of what they told us. Millennials’ mealtime habits appear to be shifting more than other generations as more become parents, one of the biggest life changes in most adults’ lives. They continue to prefer fresh, less processed food but now face greater time and energy pressures as they adapt to eating more meals at home on a consistent basis. Parents’ increased needs and kid-focused priorities often center around getting food on the table every night with hectic schedules. To help solve this, 42 percent of parents rely on pantry items and meal helpers (versus 37 percent of non-parents). Young families are likely looking for options that can help them get quick, easy meals on the table that please everyone but still fit their health and wellness criteria, such as convenience foods that have fresh, less processed cues and simple ingredient lists. Parents use a wider variety of components to get meals on the table in general, and we may see Millennials migrating back to the frozen aisle as they have kids.